Men who dance in the first light are a bunch of overpaid fools sleeping on the ground, eating more beans than beef, leaving in the dark, riding some ole’ shaky stick that is probably wilder than he is tame and doing everything he can to make leaving camp difficult while you’re trying to roll a cigarette to take a little of the chill off and whistling a little “Turkey in the Straw” to convince yourself that you’re having a good time. The excitement level is pretty high leaving the camp with these fellers. Sparks are a flyin’ from these ponies feet. It’s still plenty dark with a little light in the east. You can feel the anticipation for what the day might hold. The Boss is leading the way and I promise you the devil himself wouldn’t cross in front of him. He doesn’t get to be boss because he has some social sheepskin. 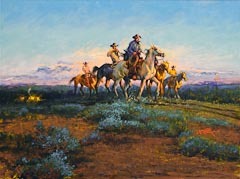 He’s earned the position from years spent handling rough horses, rough men and gathering rough cattle in rough country. You don’t run into any marshmallows out here. I’ve seen one of these men get a tick in his ear and dig it out with a stick and a little Campho-Phenique. Just about the time you get all the boogymen out of your pony’s head, the boss starts dropping men off on the day’s circle and you have to re-convince your pony of the new routine. He’s not sure of being left all by himself in big rough country where everything has a rough edge and a sharp point on it. It’s your job to get your pony to outrun and out maneuver every cow you can find in this haven of brambles and briars. These men would bail off of Niagara Falls if they were after a cow and most of these ponies soon learn they’d better bail off Niagara Falls if they’re after a cow because these fellers ain’t going to release the pressure on them until they either catch or turn that cow. The membership fees come pretty high out here and you don’t buy your way into this club. Big smoke and fancy rigs ain’t worth nothing out here and you can’t buy respect either. The only way you’ll get it is to earn it and the only way to earn it is to figure out how to keep up with the fellers that have already proved themselves and pass the test- and the test isn’t easy. 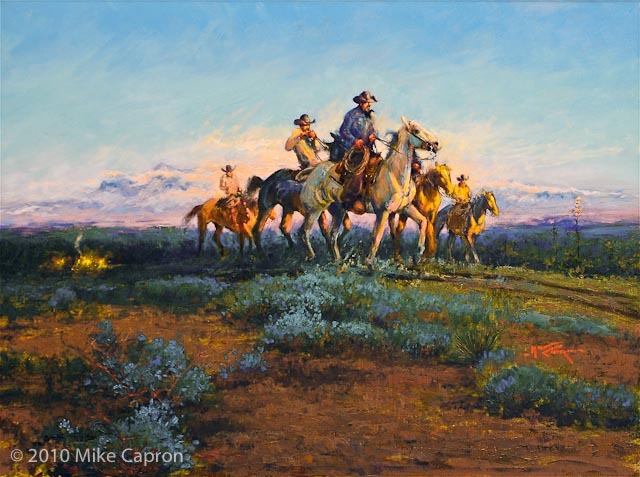 Gathering tough cattle in rough country and riding rough horses will soon weed out the faint hearted and it costs plenty of clothing and precious hide. It’s not long before they figure out that all you get out of life is what you put into it and the simple joys are enough. The first light is hard to beat in early morn and riding with one of these crews sure makes the check at the end of the month look a lot bigger.